Beast of a lens for wildlife and action photographers who want it all! Sigma has added a new lens to its Sports range of high-performance lenses with a phenomenal 60-600mm range at Photokina 2018– offering a focal length that will keep wildlife, aviation and sports photographers happy, whilst letting them shoot more normal wider scenes without changing optics. 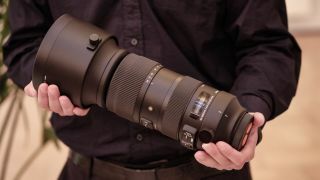 The Sigma 60-600mm F4.5-6.3 DG OS HSM is built as the absolute all-rounder – but yet, as explained by Sigma CEO Kazuto Yamaki, it does not compromise on optical quality. The 10x zoom is essentially an update of the old Sigma 50-500mm f/4.5-6.3 which was recently discontinued. Constructed from 25 elements in 19 groups, consistent image quality can be created throughout the entire zoom range. It features three FLD elements, and one SLD element. This lens also incorporates Intelligent OS optical image stabilisation adopting the latest algorithm to deliver an image stabilisation effect equivalent to 4 stops. The high-speed AF, thanks to the HSM (Hyper Sonic Motor) with an updated algorithm, is said to capture instantaneous photography movement. The lens is one of the first to use magnesium manufactured in the new plant that Sigma has built on site at its Aizu headquarters in Japan. The innovative multi-material structure also uses thermal stable composite (TSD) and CFRP (carbon fiber reinforced plastic). It comes with a built-in non-removable tripod collar, with an Arca-Swiss compatible foot. It is compatible with Sigma's MC11 mount converter (making it compatible with Sony E-mount cameras), its USB dock, and its teleconverters. The lens will be available for Canon EF, Nikon F, and Sigma SA mounts from October, and retail for £1,899.